The Starbucks email scam — phishing or for real? You are here: Home / One Step Ahead - Featured / The Starbucks email scam — phishing or for real? I’ve been a Starbucks fan for several years now. At least, until they changed their rewards program. The program is now based on how much you spend and, quite frankly, it amounts to about a 5% reward for frequent customers. Five percent isn’t much of a savings, but it does bring me to the Starbucks email scam tip. Maybe they’ve been around for a long time, but I don’t recall seeing one Starbucks email scam until this past week. The email didn’t promise riches galore, but something simple—a couple of free coffees. Oh man, with the changes in the rewards program, I really wanted this one to be for real. With two strikes against the sender of my hoped for Starbucks coupons, I made one last ditch effort and checked the domain name for the email sender. If you guessed the result was “strike three!” you’re right on the money. The site was on at least one blacklist. Definitely, those Starbies email coupons were out of the game. Thanks Terry, I appreciate the information. Got one today. You’re welcome, Eric. These guys never stop! Thanks for another helpful post. I think the “If it sounds too good to be true, it probably is.” advice is the one hardest for us to resist. Such a good deal . . . maybe it’s for real just this one time, right? 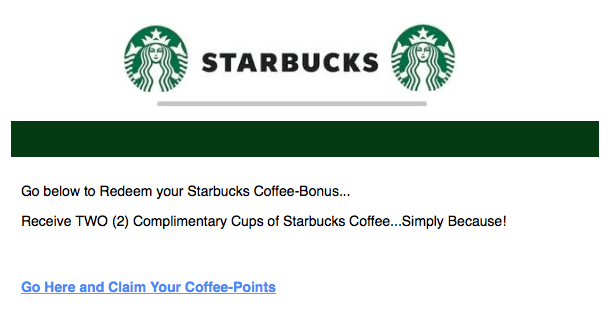 And Starbucks – I think their new rewards program is the final push I needed to resist them. I have $3.33 left on my card (about enough for one big sip these days) and then I’m done. I know, Sally, I’ve cut back on my trips considerably since the new program. I wonder how much of a backlash they’ll have, not that I expect to see any changes.